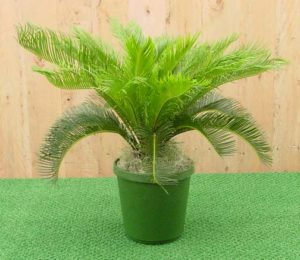 Sago palms are easy to care for but do require special needs, such as bright light, although they will tolerate low-light conditions. What they will not tolerate, however, it too much moisture. Sago palms prefer to be situated in well-drained soil, and like other cycad plants, they do not respond well to overwatering. In fact, too much water can quickly lead to root rot and eventual death. Therefore, it’s best to allow the plant to dry out some between waterings. Sago palm plants also require regular fertilizing monthly to ensure vigorous health and encourage sago palm blooms. However, these plants might take 15 years before they bloom in containers (if at all), at which time the sago palm blooms only about every third year (on average). This often takes place in late spring. Once you have determined the cause of sago palm yellowing, you’ll need to know how to treat sick sago palms effectively. For nutritional deficiencies, try feeding sago palms houseplant fertilizer regularly, about once a month. Regular balanced fertilizer is important for healthy maintenance of sago palms. If scale infestations are a problem, try using the tips found in the following article: You could also try hand picking them off or placing them outdoors to allow their natural predators to help eliminate the problem. When problems with sago palms are due to improper planting or poor drainage, you’ll need to repot the planting as soon as possible in suitable soil, not too deep, and with adequate drainage available. Contact us today!